My group of 6 that I traveled to Cape Town with included 2 vegetarians, 3 carnivores and me, a veganere (yeah I just made that up) who sometimes cheats with seafood. Finding places to eat where we all could enjoy our meals may seem tiresome but we made it work. In this post, I will highlight a few places where we ate, some vegan, some mixed, and my review of them. Before I get into to these reviews, I need to first recommend an app my girlfriend put me on on to: Happy Cow. Make sure to download this app when you are traveling to find local vegan spots and restaurants that offer vegan and vegetarian options. It will come in handy. Although, I had done some research on some places to eat vegan in Cape Town, the app proved extremely helpful to finding spots that were close to wherever I was located. Okay, on to the good stuff. Restaurant: Hungry Herbivore– it is a bit unfair to start with this one because in my opinion it is the best but it was also the first restaurant we visited in Cape Town. We went for an early dinner. Location: They have two locations. We visited the one located at 11 Orphan Street. Ambiance: It’s a intimate restaurant with table and bar seating. Service: The service is good. Servers bring you menus and explain them while also offering their preferences. Food (click food to see the menu): Amazing. Go more than once and try everything. Personally I recommend the fries, loaded or regular, Oh Sweet Kim Burger, french toast and The Cleanse- fresh juice (best green drink I ever had). My only regret is that I was too full for dessert. 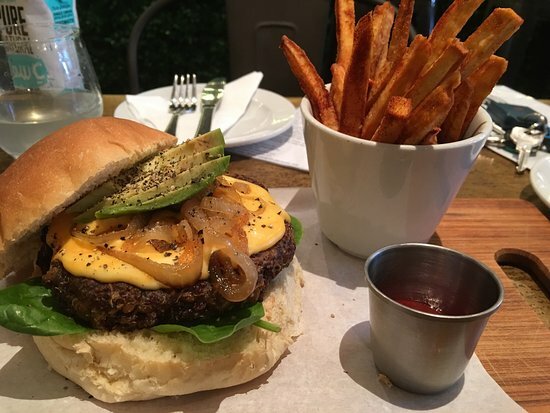 Restaurant: Royale Eatery– a burger joint that offers carnivore, vegetarian and vegan options. We went for lunch while shopping on Long Street. Ambiance: Inside has a diner feel with booths and regular seating. Service: The service was good but my husband ordered a salad and it took the longest. Our waitress was nice and when we told her we ate at the Hungry Herbivore, her face cringed. I guess they are in competition for the best vegan burgers. Sorry Royale Eatery, the Hungry Herbivore has you beat. Food: The food was good. I must compliment them on their extensive menu and variety of burgers. Restaurant: The Old Biscuit Mill. While this is not really a restaurant it is more of a collection of restaurants. It gets honorable mention because all of us were able to get good food here and it is not to be missed on your trip to Cape Town. Ambiance: It is outside but with tent coverings and stores to go into, you can escape the heat. There is live music and wonderful people everywhere. There are clothing and art shops. There is food for everyone as well as drinks. Service: Well it’s pretty crowded but we never waited in line for more than 10 minutes to get anything. Food: There is all kinds of food, from bison to sushi. I enjoyed a vegan edo wrap which was very delicious and some Sangria which was also so delicious I went back for seconds. I purchased some vegan desserts to take back to our Airbnb but they were not good. I wish I remembered the name of the restaurant, so I could tell you not to go there. 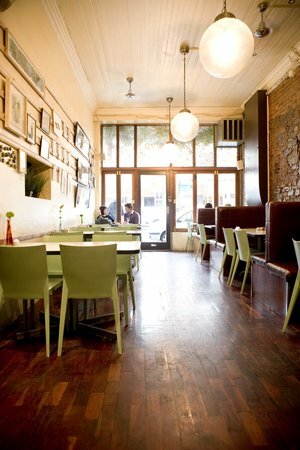 Restaurant: Tasha’s– contemporary, urban, boutique café. Everyone that I spoke to prior to going to Cape Town talked about this Butternut Squash Salad that I just had to get at Tashas. Location: Several locations around the world, from Johannesburg to Abu Dhabi. We visited the one at the Shop 7117, Victoria & Alfred Waterfront, Cape Town. 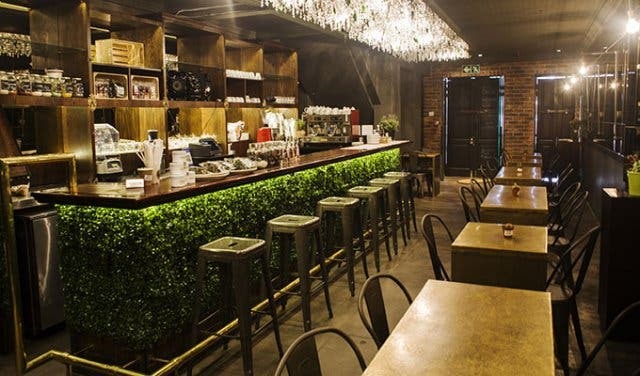 Ambiance: Warm and welcoming with flower pots hanging from the ceiling and plants around. You can sit inside or out. Service: The service was slow at first but then it picked up. Food: Of course I had the Butternut Squash salad. That’s the featured image above. The salad did not disappoint. I’ve never tasted butternut squash semi charred, sweet and delicate. It was a nice addend to a salad. I also had some beer-battered cauliflower which was yummy. I would definitely return to Tasha’s for more. Restaurant: We went to Jarryds, Espresso Bar and Eatery. A restaurant that boast a commitment to sourcing locally produced and seasonal produce. Ambiance: The restaurant reminded me of a train station stop, glass encased and airy, tall vaulted ceilings and seating for large groups. Service: The service was great with several people attending to us. Food: I was disappointed that the only true vegan item on the menu for breakfast that I wanted to order was no longer available- The Vegan ‘Nice’ Cream Slice. Instead I ordered The Summer Quinoa Breakfast bowl without the poached egg. The breakfast bowl was great and my husband’s potatoes were too. Everyone enjoyed their meal and wished we had come sooner because we were leaving Cape Town that day. Afterwards, we met Jarryd and he was sorry about the breakfast item. He assured me that next time, I could request to speak with the chef or himself and they would make accommodations to suit my preference. We visited other restaurants but I didn’t feel like they deserved to be discussed in detail. I really wish we had an authentic African dining experience. We visited an Ethiopian restaurant, Addis in Cape, but I was disappointed as outside of salads there wasn’t any options for me. Cape Town is a real gamey eating city, so carnivores will love it and can experience something new and different. We vegans have a little bit of a tougher time as usual. It was 7:00 a.m.; the sun was rising and there were no clouds in sight. We picked the perfect day to climb Table Mountain. I really didn’t know what to expect. One of my travel buddies had done some research and said he found the perfect route for us to hike up the mountain. He said it would take approximately 2-3 hours. There is no way climbing a mountain is going to take that long, I thought. We had also read that people had been robbed on the trail so we left our cameras in the car and didn’t take anything of value with us. Since we planned to take the Aerial Cableway back down, we drove up to its entrance and parked. I dressed in some work out clothes, jacket, sunglasses and sneakers and with a water bottle in one hand and my phone in the other we began our trek. We took the Platteklip Gorge route. There were plenty of people also hiking on this day that we saw at the beginning and throughout the hike. The trail is not straight. It has turns and twist, rocks and boulders and a constant uphill incline. At some points I could walk straight up and down and at others I had to crawl on all fours. Some of the trail has small fences on either side, but much of the trail does not. I had to stop several times throughout to catch my breath as it can be quite exhausting. Your mind can also play tricks on you which could lead to a panic attack for some. I had to force myself to continue looking forward to ward off a panic attack of my own. It is definitely not for the faint of heart. I was doing good until I asked one of our friends how much further we had to go, and he said “we are about halfway there”. I couldn’t believe that we only traveled halfway up the mountain. It had been at least an hour or more. I knew for sure we were almost there. I regretted asking because at that very moment knowing as far as I’d come, I wanted to turn back. Then some people were coming down the mountain and we sparked a conversation with some. One gentleman was on his 100th hike. He said he was with the charity group. He was no spring chicken and if he could do it, so could I. Well maybe not 100 times but I could definitely do it, just this once. I pushed forward and up, sweating, panting and self-motivating. I took in the sites of Cape Town below my feet. I started to enjoy the journey and the scenery and stopped focusing on the end. That was until I saw something unfamiliar, big and brown in my peripheral. I yelled and ran with new energy. I ran passed my friends and up some boulders until it was out of my sight. Later my friend told me that it was a rock hyrax. (a small furry diurnal animal belonging to the Provavidae family, more commonly known as a dassie. Although it resembles a small rabbit, the dassie is actually a hoofed mammal related to the elephant. It has a short, furry body with short hoofed legs and a small tail- https://www.tablemountain.net/blog/entry/table-mountain-for-nature-lovers) At the time, I didn’t know what it was; I just knew I wanted no parts of it. I think it gave me the boost I needed. A short while later, a coupled passed us and I asked the women if she could let out a small yelp when she got to the top, so I could hear how much further we had to go. Sensing we were nearing the top, I began to move faster. Then some relief was upon us, cool rocks and water dripping from them. I pressed my revealed skin on the cool, wet rocks and sat in the shade for a short while, gazing upon the trek behind me, down the mountain and through the gorge. We had come a long way! A few minutes later I heard the yelp in the near distance. A few winding paths later, we made it to the top! We had climbed Table Mountain. It took us 2.5 hours. Our two other friends said they had been waiting for us for over an hour. Picture my eyes rolling. It really is like a table at the top of the mountain. You can walk around and see Cape Town from all angles, tiny houses below, trees and the sea. I can only imagine what the scene looks like at sunset. We grabbed some food from the restaurant and took in the sites before buying our tickets for the aerial cableway to ride back down. There was a delay because some crazy person decided to light a few fires on the mountain and they spread rather quickly, due to the dry climate. We could see smoke and fire from the top and had to wait until the fire fighters brought in water via helicopters to get the fires under control before they would allow the cable cars to run again. Eventually we were able to ride down, right passed the fires. It was kind of unnerving to know the mountain we had just climbed was now burning. Thankfully, no injuries were reported and the culprit was caught. The ride down on the cable car was quick and I was happy that we climbed the mountain up because although the view from the top of Table Mountain is quite beautiful, it fails in comparison to the excitement of the journey of the climb up the mountain. Would I hike it again? When I was asked this question right after we came down, I said NO, rather quickly. But if you ask me that question now…I’d say YES! It was worth it. I can honestly say, I climbed the infamous Table Mountain! Side notes: Despite the stories of robberies on the mountain, we never felt unsafe. There were always plenty of people on the trail. Bring some cash or a credit card to purchase snacks and drinks at the top of the mountain. Stay hydrated by carrying and drinking plenty of water. Wear comfortable footwear with grips. Bring sunglasses. Don’t forget your camera. Tell Mr. Hyrax I said hello. If you’re thinking about climbing Table Mountain, Do It!